Sometimes you run across a craft supply and it kicks off a cascade of creativity. 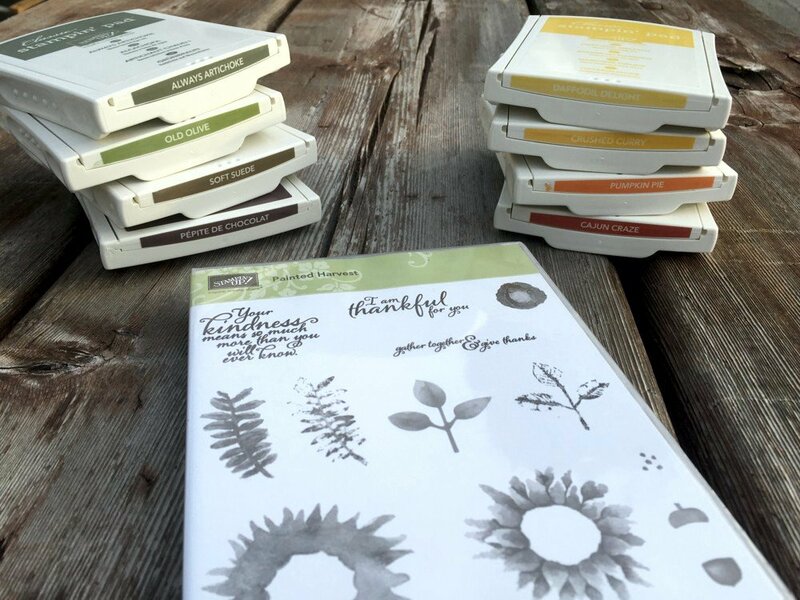 The Painted Harvest stamp set from Stampin’ Up was just one of those products. Coupled with my love of all things Fall, this stamp sethad me envisioning all sort of projects that I could use it in. Apparently, I wasn’t the only one to have this reaction. 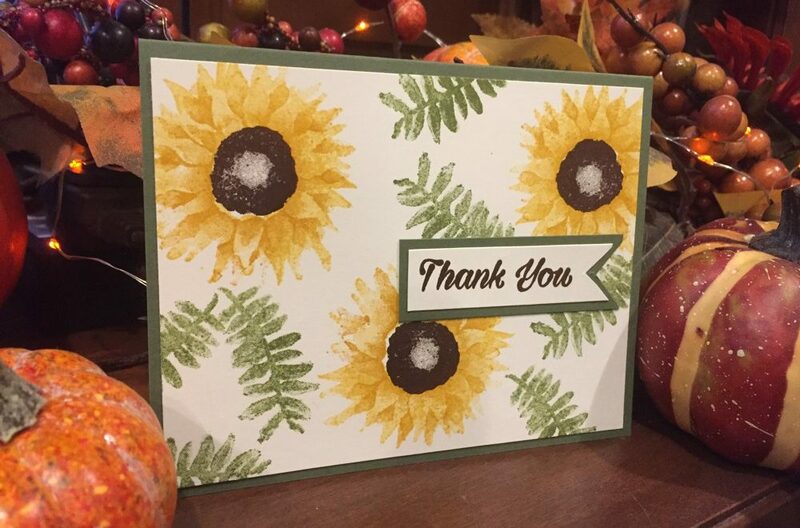 Sunflowers and layering stamps are both wildly popular this year and this is one of two sets that I bought. It arrived in my box of holiday goodies and was the first thing I pulled out to use. First things first, though. What colors to use? I had purchased most of the Stampin’ Up (SU) inks over the last year, but had never really made a clean inventory of them. So I pulled out a sheet of Whisper White cardstock and got to stamping small sample squares. I used the solid swatch stamp in this stamp set from Simon Says Stamp and put down color for all the yellows, oranges, and reds all the way through the spectrum to Cherry Cobbler. Prior to buying this swatch stamp set, I had tried cutting out a 1-inch square from the Silhouette stamp material, but it didn’t work very well. 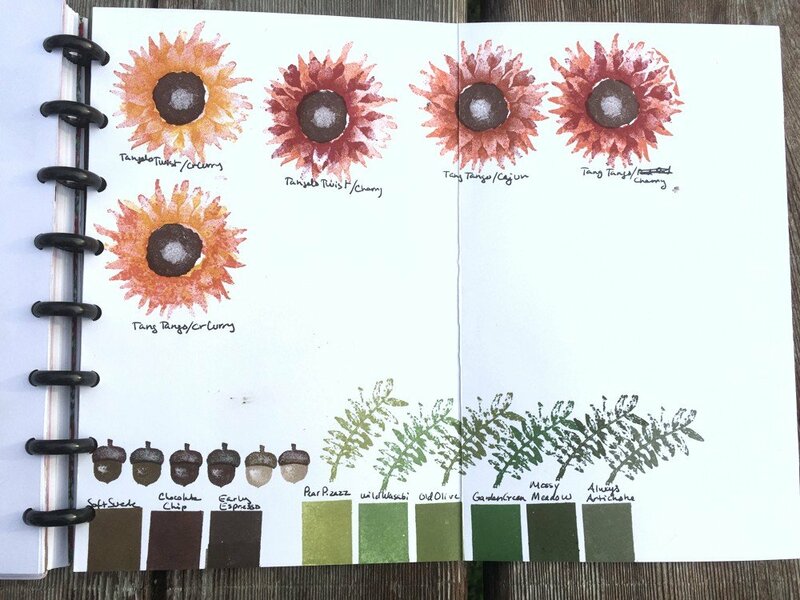 This was my first chance to use this stamp set to create swatches. 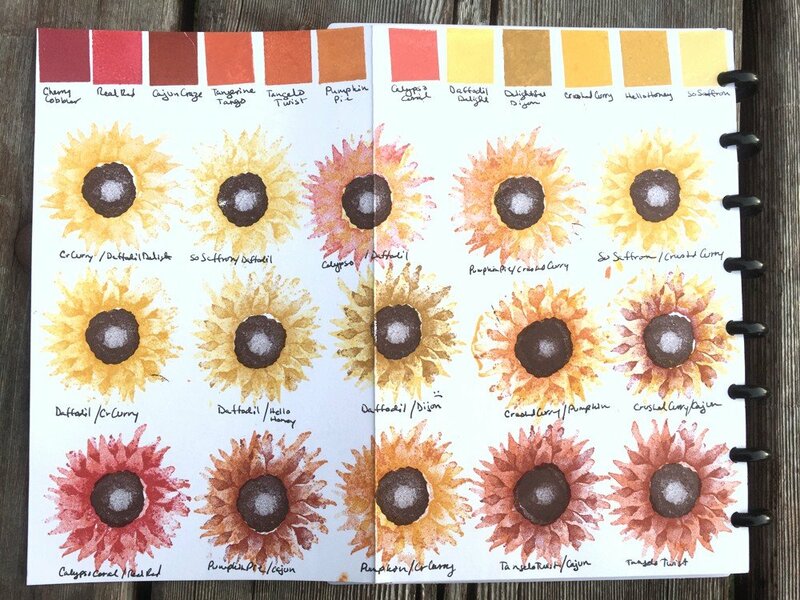 The SU sunflowers in Painted Harvest have two layers for petals and one layer for the center seed head. 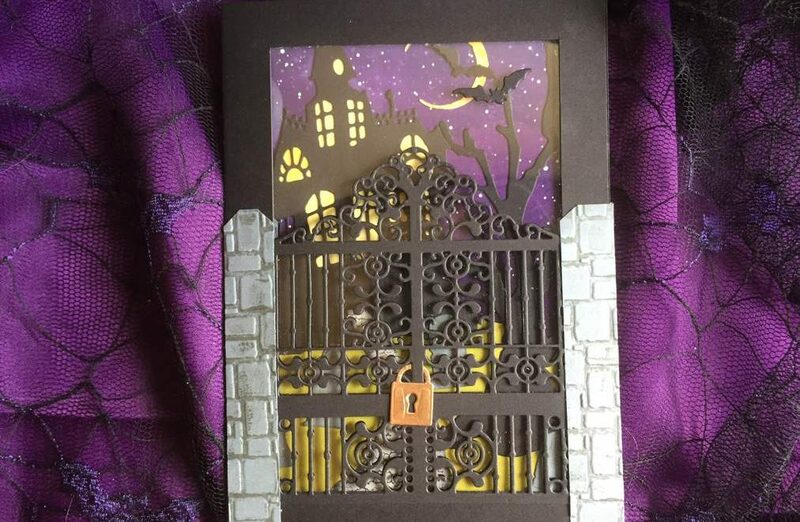 Armed with a clean set of samples, I stamped out several different color combos. I also stamped out various brown combos for the top and bottom of the acorn as well as greens for the leaf. The pictures below show the results of the different color combos. I liked the Daffodil Delight/Crushed Curry combo the best, followed by Crushed Curry/Pumpkin Pie. My favorite brown combo is a Soft Suede nut topped by a Chocolate Chip cap, coupled with Old Olive or Always Artichoke leaves. One thing that I learned during this exercise is patience. It really does take a few minutes for the paper to absorb the ink and turns stampings from meh to solid smooth images. This stamp set also requires a little practice to figure out how to line up the two layers. But it’s important to figure out to get the right layering. When it lines up, it looks great. When you don’t line it up right, the two layers melt into each other. You may also notice my notebook in the pictures above. I try to keep all of my planning and notes in one place and use these disc-bound notebooks to hold everything. I can easily take pages out when working on a project and rearrange them within the notebook. The full page punch was a little spendy, but I use these notebooks for everything so it was a good investment. Once only available online at Levenger as Circa notebooks, they have now become ubiquitous and can even be found at Wal-Mart. The best paper quality I’ve found–outside the luxurious Circa paper–is the Arc paper from Staples. As I mentioned in my purchase overview video, I like to make a list of ways that I can use a bundle before clicking on the “Add to Cart” button. For this set, I have several birthday cards planned. 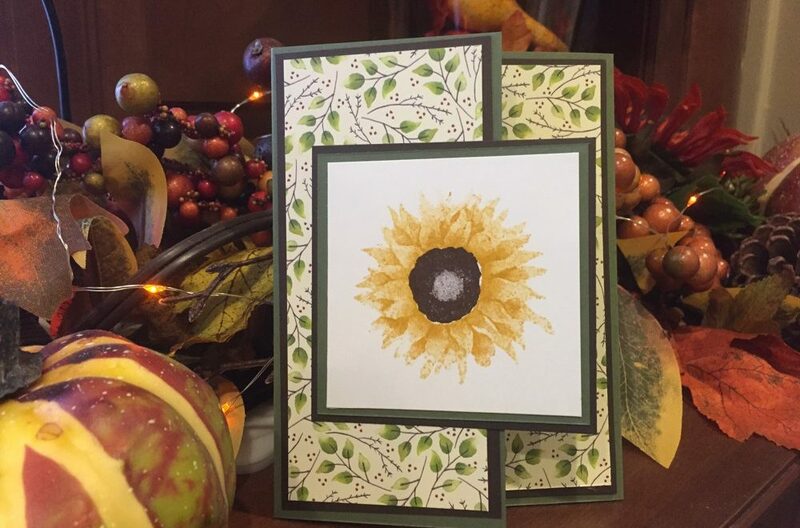 It also will be used in thank you card gift boxes. Check back over the next couple weeks to see this set used in upcoming videos and posts. Click on subscribe to get updates as new updates post!